In this post I cover how we can leverage the ROS navigation stack to let the robot autonomously drive from a given location in a map to a defined goal. I will skim over many of the details since the associated tutorials on the ROS wiki do a great job in describing how to set up the navigation stack. 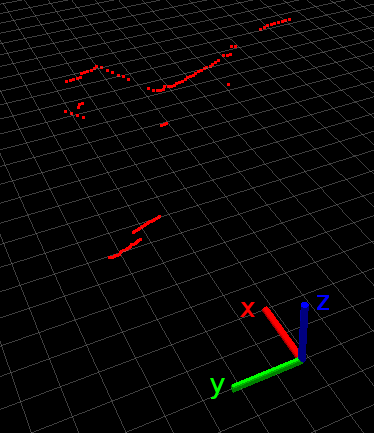 Localization of the robot in a given map using Monte Carlo Localization (MCL). For more information about MCL (including C# source code) please seee my blog post Monte Carlo Localization for Robots. Global and local path planning. Amongst other parameters, path planning most notably requires a map, information about the size (footprint) of the robot, and information about how fast the robot can drive and accelerate. Before reading on I highly recommend that you minimally read through the ROS tutorial ‘Setup and Configuration of the Navigation Stack on a Robot‘. Okay, let’s dive into the Ardros specific files. As described in my previous posts the source code is available from here: http://code.google.com/p/drh-robotics-ros/. This post is based on revision 79 of the source code. It brings in two other launch files, the first being the ardros_configuration.launch which we already know from theprevious post. It handles the Ardros specific aspects including odometry, drive commands, and the usage of the KInect sensor as a fake laser scanner. The first relevant line brings up the map server and specifies what map it should serve up. It includes the path to the map which needs to be adjusted accordingly. Secondly it imports the launch file for AMCL (adaptive (or KLD-sampling) Monte Carlo localization) configured for a robot with differential drive (see odom_model_type inamcl_diff.launch). AMCL is responsible for localizing the robot on the map. AMCL uses numerous parameters, many of which are specified in the launch file. I use largely the default values but I increased the particle count numbers. I expect that going forward I will likely fine tune more of these parameters. 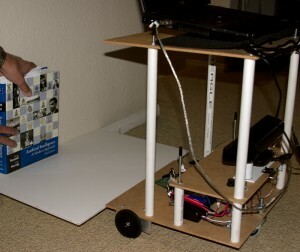 It is worth noting that Ardros is quite similar to Willow Garage’s turtlebot in its use of the Kinect sensor in conjunction with the navigation stack. 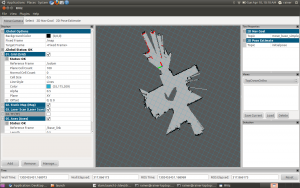 I started to use the node pointcloud_to_laserscan before it became part of the turtlebot stack and hence had to come up with my own launch files and associated parameters. In the future I should be able to borrow quite a bit from turtlebot, minimally better parameters for AMCL. Pretend that the robot footprint reaches out beyond the front wheels further than it actually does. You will probably see a number of error messages in the first terminal since the robot has not been located in the map. To locate the robot, set the starting pose by clicking on the ‘2D Pose Estimate’ button in rviz, followed by clicking on the current location of the robot in the map and, while still holding the left mouse button, dragging the mouse in the direction the robot faces. After specifying the goal in the same way after clicking on the ‘2D Nav Goal’ button you should see the planned path and the robot should start driving towards the goal. The video below is the recording of a test run showing the output in rviz while Ardros navigates a room. The video shows how the initial pose and the goal are selected. Initially the probabilistic cloud of poses used by AMCL is very wide. As the robot drives around the cloud condenses as the robot position determined from the odometry and laser scan information becomes better defined. 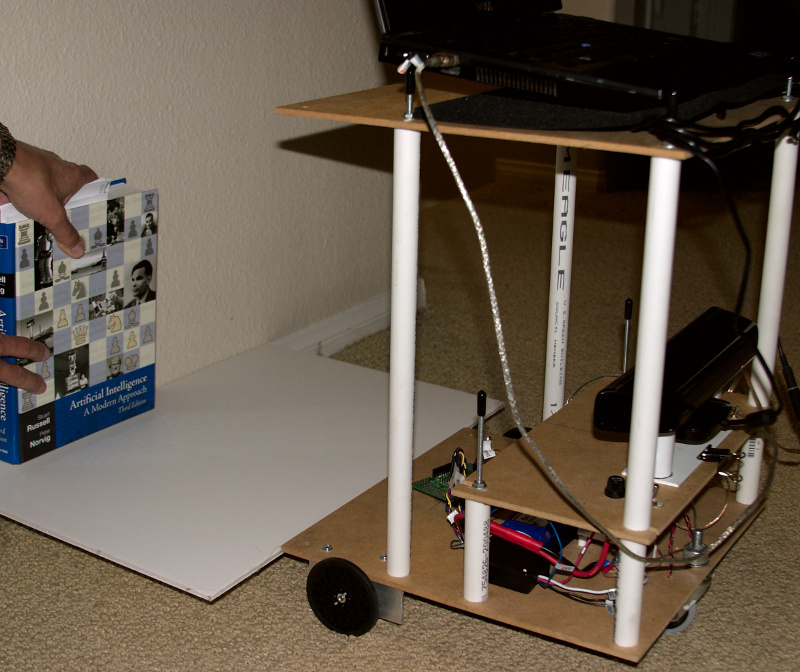 The video also shows the calculated path that the robot tries to follow to get to the specified goal. So far we really did not tap much into the power of ROS. Teleoperation and dead reckoning was just a way to ‘warm up’ and get familiar with the basics of ROS. This is about to change as we are getting ready to leverage ROS’s implementation of SLAM (Simultaneous Localization and Mapping). The associated ROS package isgmapping which wraps the open source GMapping implementation that is available on OpenSlam.org. In order to use gmapping we need a source of odometry information (Ardros already provides this) and a source of depth information. Typically laser scanners are used to get the depth information. They are accurate and fast but also quite expensive and hence not a very attractive choice for hobby robotics. Instead of a laser scanner I am using the Microsoft Kinect sensor which provides rgb + d information (color video plus depth information). To use the depth image for SLAM we convert the point cloud to a faked laser scan signal by cutting a horizontal slice out of the image and using the nearest distance (closest depth) in each column. Fortunately we don’t need to code this ourselves. The pointcloud_to_laserscan package which is part of the turtlebot stack already covers this. 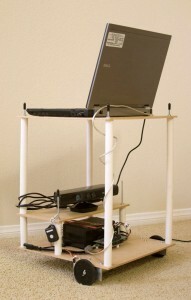 The turtlebot stack does not come with desktop-full and needs to be installed separately. The remainder of this blog requires revision 70 of my Ardros package. For details about how to get the Ardros source code please refer to my blog entry Ardros – Dead Reckoning but make sure that you use the newer revision. Add the display type ‘Laser Scan’ and select the topic /scan for it. 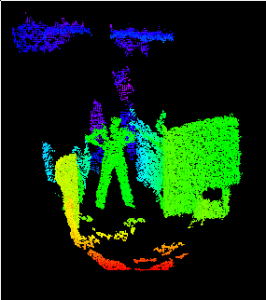 You should now see the laser scan data as derived from Kinect’s point cloud. For the screenshot below I added a grid with a cell size 0f 0.1m to the rviz display and also included a tf (transform) display showing only the /openni_camera frame. For clarification I added the x, y, z labels after taking the screenshot. The first include statement brings in the openni_node launch file which brings up the Kinect camera (openni camera) and the tf transformations that link the various camera frames (depth, rgb, etc.) together. Then a node of type nodelet named openni_manager is spun up. It acts as the container for other nodelets. Nodelets are like nodes but instead of running as their own process they are loaded into a parent node of type nodelet. Since multiple nodelets execute in the same process they can very efficiently share data. This is relevant when large amounts of data (like video frames) are processed. The launch file causes two nodelets to be loaded to a) throttle the rgb-d frame rate down to 2 Hertz and b) to cut a slice out of each rgb-d frame, calculate its distance column by column and assemble it as a laser scan data structure published on the topic /scan. Both nodelets are part of the turtlebot stack. 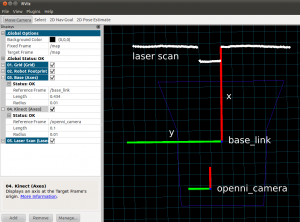 CloudToScan supports a couple of parameters that define the size and location of the slice that is used as the basis for the laser scan data. I use the default values. For details please refer to the source code. Finally we are ready to get SLAM working. As inputs the SLAM algorithm requires odometry information and laser scan data. We provide both by using the launch file ‘ardros_configuration.launch‘. 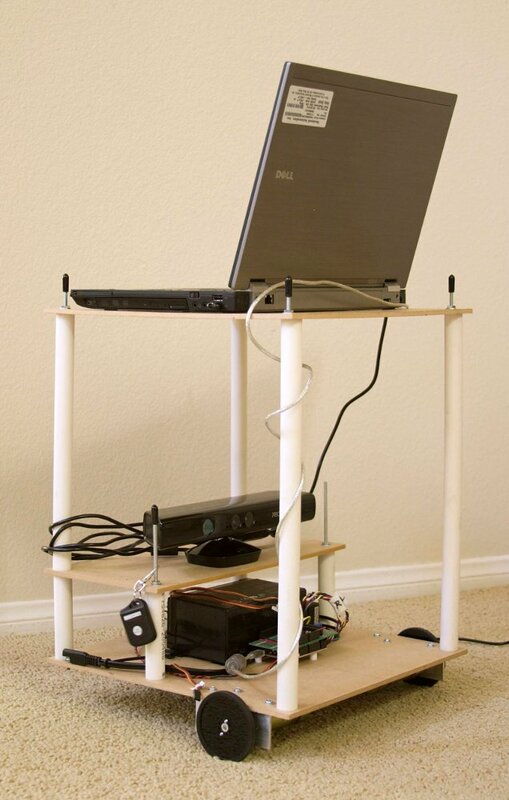 The content is best explained from bottom to top: We launch the arduino node which represents the robot and also launch the kinect based laser scanner as discussed above. In addition we need to publish a tf transform that relates the odometry frame base_link with the openni_camera frame. 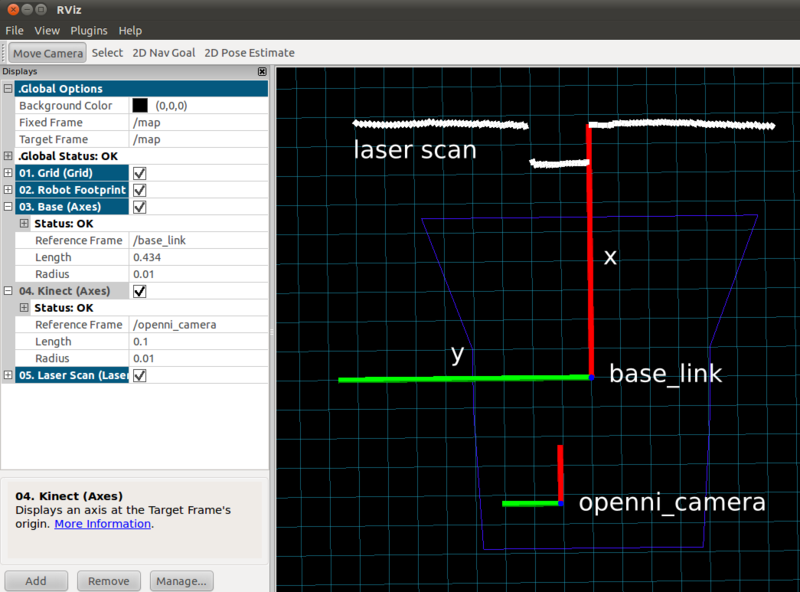 This transformation makes it possible to transform the laser scan data into the base_link frame. In the photo you can see where the Kinect sensor is located on the robot. As an example here is snapshot of a sample run and a screen recording that shows how it evolved. The other key difference is that we now leverage the odometry transformation information that the arduino node publishes (represented by the ‘tf’ lollipop in the block diagram above). The DeadReckoning.py node is modeled after the corresponding C++ node in Willow Garage PR2 stack ‘Using the base controller with odometry and transform information‘. The path to the ardros folder might need to be adjusted. Now we are ready to spin up the arduino node. Open a new terminal and enterroscoreThis will start the ros server. # The speed controller parameters inlcude the P and I gains for the three PI controllers and the command timeout for the speed controller in seconds. # If no velocity command arrives for more than the specified timeout then the speed controller will stop the robot. In the constructor the instance is registered as a ROS node. Since the node will publish twist messages on the cmd_vel topic a corresponding publisher needs to be created. In order to get information about the transformation from the /odom frame to the robot’s /base_link frame we need a TransformListener. Finally we wait up to 4 seconds for the requested transformation to arrive. If we don’t get a message within this time the constructor fails. # ordered in tf.TransformBroadcaster's sendTransform function. The Turn function is structured in the same way. Since angles are involved it is slightly more complex but hopefully the code is clear enough to understand. For a while now I have been following Willow Garage’s open source ROS (Robot Operating System). It just celebrated its third anniversary showing impressive growth with more and more universities and companies using and extending ROS: http://www.willowgarage.com/blog/2010/11/08/happy-3rd-anniversary-ros. Furthermore ROS is beginning to enter the hobby market. As a first step to get familiar with ROS I decided to create a simple package that would allow me to receive lines of text from the Arduino board and publish them into ROS. Andrew Harris has already published a package for Arduino (http://www.ros.org/news/2010/01/arduino-and-cmucam3-support-for-ros.html) that uses an efficient binary protocol to communicate between Arduino and ROS. I might eventually use it but nothing beats writing a bit of software yourself when it comes to understanding a new software infrastructure. port: The serial port to listen to. In the __main__ function at the bottom of the source file an instance of the Arduino class is instantiated with the appropriate port and baud rate. 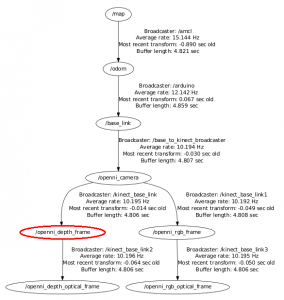 In the constructor the ROS topic ‘serial’ is published and the node is initialized. Finally an instance of the helper class SerialDataGateway is created (more info below). Once this is done the Arduino instance is started. 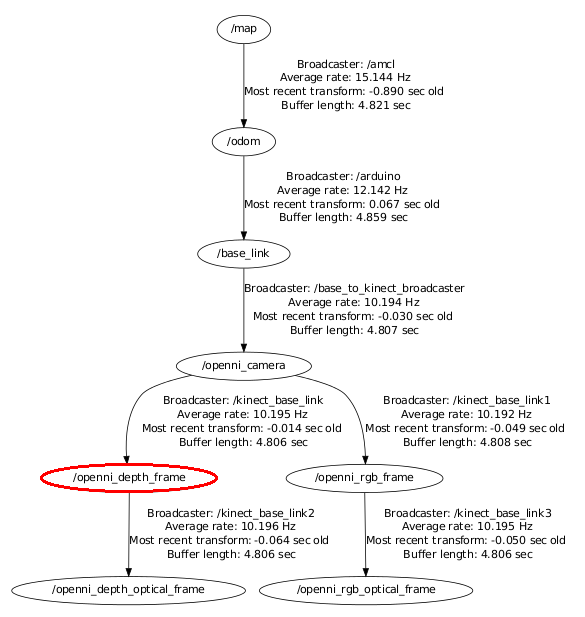 The call to rospy.Spin() ensures that the program keeps running. The helper class SerialDataGateway is responsible for receiving data via the serial port and assembling the data into individual lines. When it receives a ‘\n’ it calls into the line handler function that was passed into the constructor. The class uses a worker thread which in the current usage pattern is not really necessary. But it allows me to enhance the node later to support read and write operations in parallel. receivedLineHandler: The function to call when a line was received. The function simply logs the line and then publishes it as a string. In a real world scenario I would modify the function to parse the line and extract, say, pose data (x, y, and angle). Correspondingly a pose message rather than a simple string message would be published. Hook up an Ardunino board running a sketch that causes a line to be written to the serial port periodically. Provided the port and baud rate specified in Arduino.py match your setup you should have a running ROS Arduino node now. Next we want to tap into the published topic. You should see the published lines fly by in this terminal. On the left is the /arduino node with the exposed /serial topic. The node in the middle is the result of the rostopic app that we started. It subscribes to the /serial topic and displays the values in the terminal. This concludes my first baby step into the world of ROS.